On March 29, a Mental Health Reform Open Forum was hosted at Innis College in light of a student death by suicide earlier this month and the ongoing discussion on mental health issues at U of T.
First-year students Oliver Daniel, Annie Liu, Kathy Sun, and Jehan Vakharia hosted what is hoped to be the first of many consultations with students, staff, and faculty. The forum was intended as “a safe open space to encourage suggestions and gather ideas” to address and improve mental health supports at Innis College and U of T as a whole. The main initiatives brought to the table include the instatement of a mental health director or commissioner within Innis College for the upcoming academic year and a joint letter to Executive Director of the Health & Wellness Centre Janine Robb demanding institutional change to U of T’s mental health system. Of the seven Arts & Science college student unions and councils, University College, Woodsworth College, and Victoria University are the only three with mental health or wellness commissions. While discussion also encompassed universitywide infrastructure, students repeatedly returned to the lack of available and accessible resources both on and off-campus. While the university often directs students to a set of external resources, a number of students at the forum noted that Good2Talk, a helpline for postsecondary students, is often highlighted but also often overloaded. This culminated in a resounding call from students for on-campus crisis supports. 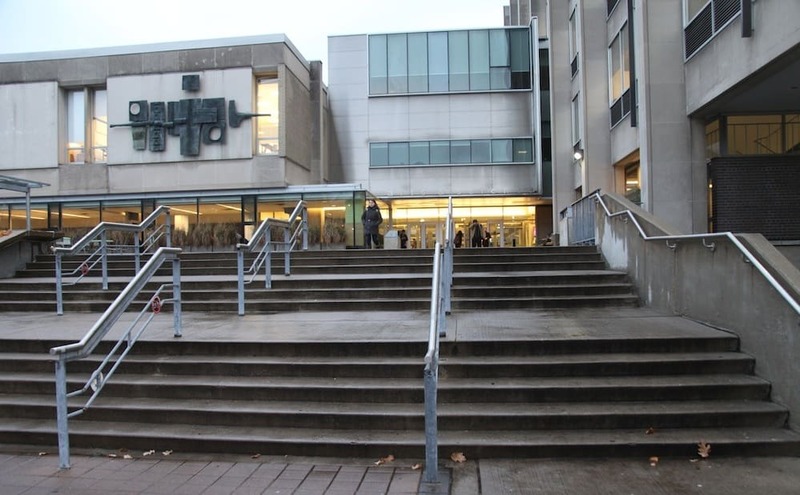 Campus councillors, Vakharia noted, would also be more familiar with issues specific to U of T.
At the Health & Wellness Centre, students are said to have months-long wait times for appointments, with sessions for anxiety coping and cognitive behavioural therapy only accessible with a prescription from a Health & Wellness doctor. Attention was also drawn to the sensitivity and intersectionality of supports by and for students, staff, and faculty. The topic was brought up following conversations about introducing student-run peer support networks at Innis College to provide students in precarious situations with immediate, on-the-ground assistance. 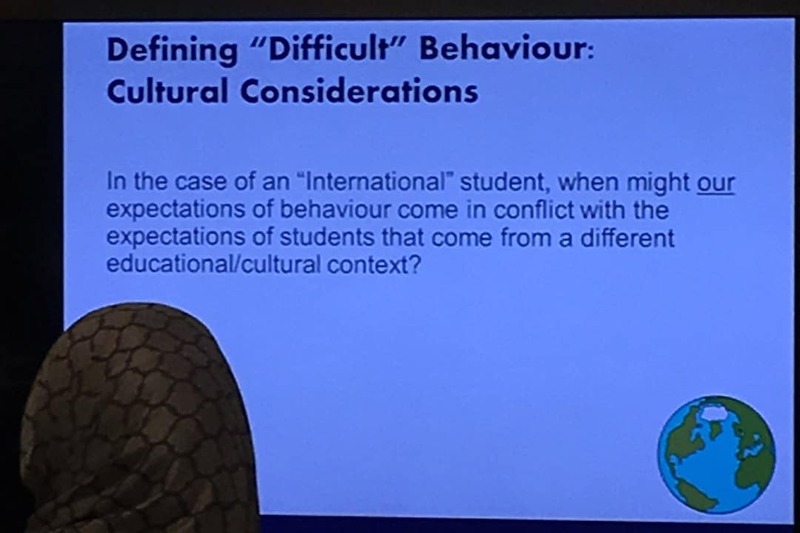 Accounting for these concerns, the organizers noted that a conscious effort would be made to form a representative volunteer base, paying mind to gender, cultural experiences, and international versus domestic student backgrounds. The organizers also foresee volunteers receiving training similar to that of dons, which includes safeTALK for suicide prevention, as well as training on self-awareness to recognize when they are unable to provide adequate support by themselves. In response to a student’s suggestion to mandate mental health training at Innis College, Dean of Students Steve Masse agreed that such training is important. Job training for occupational hazards and physical disabilities is already instituted at the college and across U of T, as it is legislated by the provincial government. According to Masse, while there are employees with varying degrees of training — from safeTALK suicide prevention workshops to professional certifications — the university should strive to train as many people as possible. Closing the discussion, Daniel presented the question, “Who is responsible for making sure that students are well?” Whereas one student referred to President Meric Gertler’s recent letter asserting that the administration is “strongly committed to collaborating,” others pointed out that responsibility lies with all members of the U of T community. Liu emphasized the need for “some resources at every level,” as individual concerns are best addressed by those involved in each specific area. Since the power ultimately lies with those at the top because they control the funding, Vakharia asserted that the administration needs to do more in order for students, staff, and faculty to follow suit. Expressing his support for the organizers’ initiative, he suggested building a resource base and hosting seminars that allow students to participate voluntarily, anonymously, and as actively or passively as they desire. He also reminds students to maintain a partnership with the administration and not take an adversarial stance. TES is “the department responsible for coordinating quiz, term test, and final examination accommodations for students with documented disabilities,” according to its website. It employs roughly 40 to 45 “highly-qualified graduate students” to act as invigilators. The issue regarding training sessions was first brought to light by a Facebook post made by an invigilator who had attended a training session on September 5. 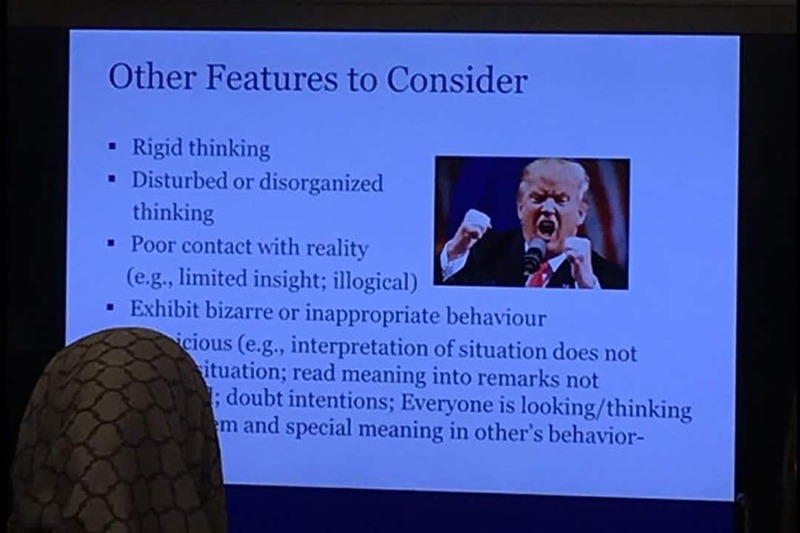 In particular, she and other invigilators took issue with two presentation slides that they believed described students with disabilities as “difficult” and comparable to US President Donald Trump. The slides were presented as part of their training to become invigilators. In an interview with The Varsity, Senior Director of Student Experience David Newman clarified that those slides were part of general de-escalation training given by the Student Progress and Support Team and were not specific to students with disabilities. “The training was really about dealing with difficult situations and it was not about any specific group and it was not developed specifically for this group,” said Newman. Newman continued that this presentation is given to many groups on campus, though he did not specify which ones. “They’re invited to come train people who work with students with disabilities and they weren’t talking about students with disabilities… There’s something that doesn’t add up to me about that defence,” Davis said. The description of TES as providing a customer service was confirmed by two other invigilators who wished to remain anonymous for fear of reprisal. Two current invigilators and one former invigilator agreed with Davis’ description of the “toxic” atmosphere at TES. The former invigilator told The Varsity that staff would be admonished when they tried to speak out against problems that they saw, particularly when it was about standing up for students. The invigilators who spoke to The Varsity said that issues with the university’s treatment of disability have been a longstanding problem that has become worse in recent years. They point to the example of training that increasingly recommends that invigilators call police when they encounter difficulties. With the new Ontario Human Rights Commission (OHRC) policy that includes broader definitions of disability and ableism and stresses the importance of accessible education, it seems that Ontario is taking a step forward to further naturalize disabled people in university environments. However, many students are likely still unaware as to how the university environment might be exclusionary or what discrimination toward disabled people looks like. Disability is a very broad category that holds within it much variation, from various physical disabilities to learning disabilities to chronic illnesses to certain mental illnesses. These disparate groups of people are united in some aspect by their societal treatment: ableism. Ableism can be described as a guiding set of negative and derogatory beliefs about disability and disabled people that can manifest in stereotypes, exclusion, discrimination, and abuse. These beliefs are woven deeply into our culture: into our language, in which descriptors for disability are often substituted for ‘bad’ or ‘wrong’; and into our media and art, in which disabled bodies and minds are frequently used as symbols for degeneration, perversion, or evil. Disability, in history, has often been used as an excuse for denying the rights of various groups. For example, it was once argued that women were mentally disabled in relation to men, which is why they could not carry the responsibility of voting in the United States. Certain characteristics of women, real or imagined, were used to point to some underlying ‘deficiency’ that rendered them incompetent. This process, which surely seems atrocious to us now in retrospect, is still weaponized against disabled people. However, discrimination as a result of ableism is difficult to challenge because disability is so naturalized as an inherently bad quality. Unlike other systems of marginalization that are based on race, ethnicity, religion, gender, or class, it is seen as fitting that a disabled person be found inferior to an able-bodied person. In a ‘common sense’ way, it seems right that disabled persons be thought of as lacking or deficient. This compulsive negative valuation usually does not rear its head outright, but obscures itself behind discourses of competency, skill, or ability. It is therefore seen as valid when a boss fires a disabled employee instead of putting in effort to accommodate them for the ‘common sense’ reason that the employee is less ‘capable’ compared to non-disabled employees. The continual reaffirmation of disability as a way-of-being that is wrong, unnatural, or negatively-valued is coupled with a near-total exclusion of disability, both in the public material sphere and in the public consciousness. The city teems with markers of exclusion: stairs in the entranceway to a shop, a subway station with no elevator, a lack of braille on public notices. These material markers speak to an exclusion of disability from the public consciousness. Despite the presence of disability everywhere in our culture, disabled bodies are not thought of as immediately existent; they are not thought of as potential inhabitants of space. The situation is mirrored and perpetuated on university campuses. The disabled student is not thought of as a rightful inhabitant of the university environment. There are some concessions made in attempts to accommodate the student — for instance, Accessibility Services at U of T — but just the concept of an accommodation mechanism points to the fact that our university, at base, is not constructed with disabled students in mind. If a structure needs to be especially manipulated in order to be accessed by disabled people, then that structure is intrinsically designed non-inclusively. The underlying structure is inaccessible and might only become more accessible with various tweaks to the foundations. These tweaks, of course, are available only to those who, through various navigations of bureaucracy, prove themselves to be ‘disabled enough’ to deserve them. The idea of accommodations also places the onus of the work on the disabled students rather than on the institution. The student needs to especially register with a service, undergo medical examinations and cross-examining, and provide letters of reference just to obtain some degree of comfort in their classes or be able to complete their work. Last semester, I had a class on the third floor of a building, and for a period of several weeks, the elevator was out of service. The university had been cognizant enough to place a sign outside that kindly informed that the elevator was out of service — but that was the extent of their efforts. It was only until I personally ventured to Accessibility Services and informed them that it was difficult for me to attend my class that the elevator was fixed. I ask, what is the meaning of accessibility when the work to render things accessible needs to be performed by those being excluded? Why not render the university environment accessible and accommodating as a baseline and not just as a special concession granted to a select few? Why not fit classrooms with more comfortable chairs, give extensions to all those who ask for them, and ensure that all buildings are fully accessible at all times? If this were done, the disabled student might be assumed as a natural inhabitant of the university environment and not as an outsider who must constantly prove their case to be allowed to enter the front hallway. However, we can ascertain that this subsuming of the disabled student into the university environment is a process to which the university is actively opposed. One only has to look at the school’s policies policing the inclusion of its disabled students — for example, the university-mandated leave of absence policy (UMLAP), which passed this summer. With such a policy, the university re-establishes its ability to exclude and exile disabled students who seem to them to be wrongful inhabitants — in this case, those who are too mentally ill, in ways that the university deems unfitting. This policy has yet to be used against a student — and one might be optimistic that it is challengeable. The first version of the policy was strongly and explicitly opposed by the OHRC, and it is likely not coincidental that its recent statement on accessible education coincides with the passing of a later version of the policy. Though the naturalization of the disabled student as a rightful inhabitant of the university environment is being contested by administration, an ally might yet be found in the OHRC. This might prove useful in the future, since discrimination against mentally ill students by universities is commonplace. Earlier this year, and south of the border, a student who checked herself into a hospital for anxiety was later barred from returning to her dorm by the University of Maryland. In words that eerily echo the UMLAP, administration cited concerns over her ability to live on campus. A few years back, a Princeton University student recovering from a suicide attempt was barred from attending his classes and escorted off campus by security guards. Again, this exclusion was justified by concerns over the student’s ability, reflecting the rhetoric that justifies discrimination against disabled people. Besides the need for structural changes on campus, how able-bodied students might push for increased inclusion of disabled persons in a university environment remains an important question. It does not have to necessitate intense amounts of activism and protest. It is as simple as remaining aware of one’s environment and disrupting the normalcy of exclusion in subtle ways. When you enter a classroom, you may ask yourself about the ways in which this environment is inaccessible and in what ways the rules set out by the instructor lend toward exclusionary practices. By drawing attention to these aspects, one can spread awareness of the normative practices of exclusion — through speaking about them to your peers and instructors, and opening up discussions about accessibility. In these ways, disability might become a real presence in the university environment. A 2016 survey conducted by the Canadian Association of College & University Students Services estimated that nearly a fifth of Canadian post-secondary students struggle with mental health. The University of Toronto is certainly not an exception to this; its intense, competitive academic atmosphere can leave students feeling isolated. The spontaneity of symptoms of mental health issues can make it difficult for students to complete their work on time or plan with professors for adjustments. Mathias Memmel, President of the UTSU, told The Varsity, “The administration’s primary focus is academic excellence, sometimes at the expense of students’ well-being. U of T was one of the last universities to start taking mental health issues seriously.” Memmel added that things are slowly improving, but the university’s “instutitional priorities” remain a barrier. If you are a student struggling with your mental health, you are guaranteed fundamental rights to make education accessible. The following rights represent only a portion of those afforded to you. You have the right to register with the Accessibility Services office on your campus. While you are required to provide documentation of your disability and its related functional limitations, you do not need to disclose your specific diagnosis to instructors. You may have the right to make-up tests, extensions on coursework, alternative evaluation formats, and exam rescheduling. These adjustments are made on a case-by-case basis depending on your condition and recommendation from documentation from health providers. You have the right to use service animals and support persons on campus. Possible exceptions are service animals being prohibited from areas where food is stored and served, and when their presence endangers another person’s health and safety. You have the right to access Health and Wellness Centre services, which include individual psychotherapy, pharmacotherapy, and group therapy. Students with disordered eating also have the right to access a dietician on campus. Finally, whether or not you have accessibility needs, you have the right to file a petition for extensions on term work and final exams or for other special circumstances. UTM and UTSC students can file with their registrar offices, and UTSG students can file with their faculty. If your petition is denied, you have the right to appeal. For students who feel their rights have been violated, the Office of the Ombudsperson serves as an impartial, confidential, independent, and accessible third party. They analyze problems, identify possible solutions, and provide advice on how to proceed. Memmel mentioned the UTSU’s recently-launched online help desk service, which aims to connect students to the right resources and provide one-on-one consultation for any academic, financial, or service issues they may experience. Additionally, the Association of Part-Time Undergraduate Students (APUS) has formed a mental health coalition with the goal of presenting “a more student-focused and holistic set of recommendations to the University to address student stress and distress, and to advocate for better resources and supports for students.” Both the University College Literary and Athletic Society and the UTSU have mental wellness commissions, and the engineers’ Skule has a director dedicated solely to mental health initiatives for students in its faculty. For crisis situations, more information on resources, or advice on dealing with mental illness, students can access Good2Talk, a helpline dedicated to student mental health, open 24 hours per day, 365 days per year. Disclosure: Joshua Grondin is the Associate to the Vice-President External at the UTSU.